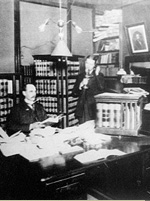 Raymond Best started his law practice in 1892 when he purchased the law library of John G. North, son of Riverside founder John W. North. Located in the Evans Building, at the corner of Main Street and Eighth Street (now University Avenue), the office remained in its historic location until 1958, when the firm moved to Orange and Twelfth streets. As well as practicing law, Raymond owned the Riverside Abstract Company, and he rode the Santa Fe steam daily to the county seat in San Bernardino to extract title records until 1915 when he sold the business to focus solely on his law career. His home on the southeast corner of Sixth and Lemon was where he practiced his two avid hobbies, photography and flower gardening, specializing in dahlias and amaryllis. 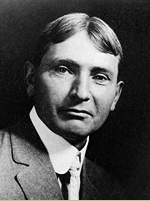 An acclaimed public speaker, Raymond Best ran for Riverside District Attorney in 1918. His son, Eugene Best, also at Evergreen, graduated as an engineer from Stanford in 1915 and began studying law on his own, passing the bar in 1918. Gene Best taught aerial gunnery at the aviation school in Berkeley during World War I and remained in northern California until 1922, when he returned home at Ray’s request to join him in the Evans Building law office. In 1925, the firm became Best & Best. There were only 31 practicing lawyers listed in the Riverside area. The firm grew, taking on new lawyers including John G. Gabbert in 1938, who went on to become a partner on 1941. The firm’s prominence continued, with Eugene Best being elected to the Board of Governors of the State Bar and John Gabbert serving as President of the Riverside County Bar Association in 1945. In 1946, James H. Krieger joined the firm and a year later, the firm was named Best, Best, Gabbert and Krieger until in 1949, Governor Earl Warren named Gabbert to a judgeship in the Riverside County Superior Court, and the name became Best Best & Krieger. At Raymond Best’s retirement open house, held to celebrate his 86th birthday and 62 years as a lawyer, he quipped, “there are several ways to achieve fame. The easiest, the one I practiced, is longevity.” He died in 1957, aged 89. Today, the law firm he founded is still called Best Best & Krieger and is one of the 50 largest in California.